The Hotel Best Western PLUS Alfa Aeropuerto is located in Barcelona, Spain, two kilometers from Barcelona International Airport. Montjuic, the National Museum of Catalonia and Plaza d'Espanya are within five kilometers of the hotel. Las Ramblas and the Gothic Quarter are six kilometers away. Complimentary shuttle service to and from the airport and select local attractions is available. The hotel serves buffet-style breakfasts daily. A la carte entrees, daily specials and a wine list are available in the Gran Mercat restaurant, which specializes in seasonal and international cuisines. Drinks and light snacks are offered in the lounge bar, which also features a television. Recreational amenities include an indoor pool, sauna and fitness room with cardiovascular equipment. The hotel offers complimentary wireless Internet access. Complimentary private parking is provided in the hotel's garage. 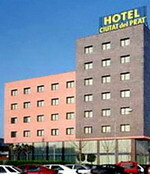 Hotel Ciutat Del Prat is located in El Prat De Llobregat, the industrial suburb of Barcelona, Spain. 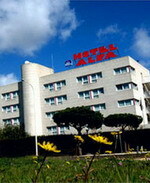 The hotel stands less than two kilometers from Barcelona Airport and offers complimentary pick-up and drop-off service. Among the nearby attractions, Placa de Sant Jaume, the famous Gothic Quarter square, is located seven kilometers from the hotel. Palau Sant Jordi, the Olympic sports centre, also stands seven kilometers away. Hotel Ciutat Del Prat welcomes guests in a contemporary-style lobby featuring expansive ceilings and polished marble floors. Aiming to rejuvenate, the hotel offers a fitness center, sauna and indoor pool surrounded by lounge chairs. Sinfonia Restaurant serves specialty entrees in an elegant dining room furnished with antique-style furniture, white linens and chandeliers. The Tryp Barcelona Aeropuerto Hotel is situated next to Barcelona Airport, and one kilometre from the train station. Placa d'Espanya is 7.5 kilometres away, and the sights in Barcelona's centre are 15 kilometres from the hotel. The modern hotel is decorated in a minimalist style, and offers complimentary shuttle transfers to and from Barcelona Airport. Wireless Internet access is available for a surcharge in the lobby, and a parking garage is available on site (surcharge). The hotel also offers a fitness centre. Each morning a breakfast buffet is available for a surcharge. Restaurante Mediterraneo also serves lunch and dinner daily, and a lobby bar opens throughout the day. There are 205 air-conditioned guestrooms available at the Tryp Barcelona Aeropuerto Hotel, featuring contemporary decor with light colours and pale oak wood furniture. 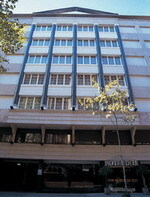 Avenida Diagonal (Diagonal Avenue) is the main avenue in Barcelona. Diagonal crosses the city, which gave it the name Diagonal, and reaches to the sea. There are many wonderful boutiques and shops to be found - a shopper's paradise. The high-rise Hotel Rey Juan Carlos I is located in Barcelona, Spain, within two kilometres of Camp Nou stadium and six kilometres from Las Ramblas. The nearest metro station is Zona Universitaria. Open for breakfast (surcharge), lunch and dinner, Café Polo has a daily themed menu ranging from Catalan to Basque dishes. A long, extensive buffet table and furnishings divide the restaurant into an informal area with timber chairs and a more elegant and formal area. The Garden Restaurant, in the exotic garden, offers a modern Mediterranean menu. The low-lit Aris Bar resembles an old-style cocktail bar, and mixed drinks and cocktails are its speciality. The Royal Fitness health spa (surcharge) features a gym, two heated indoor pools, jetted tubs, sauna, steam bath, aroma cabins and hydro-massage showers. There's a heated outdoor pool open all year. 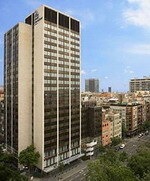 The Melia Barcelona Sarriá is located in Barcelona, Spain. La Sagrada Familia is two kilometres away, the Picasso Museum is four kilometres away, and Las Ramblas is at a five kilometre distance. 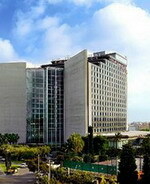 The nearest metro station is situated 500 metres from the hotel. The hotel houses a fitness room, and the onsite spa offers an indoor pool, sauna, steam room, and massage area. The multilingual concierge is on hand to provide sightseeing advice, and those arriving by car will find garage parking available. Further amenities include 24-hour room service and dry cleaning facilities. The Melia Barcelona houses two restaurants, a cafeteria, and a piano bar. 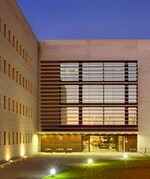 The hotel houses the Espai Sarria conference centre with seven meeting rooms.